Finigans Gourmet Fish and Chips stands on one corner of the block of shops on Aralia Street in Nightcliff. The decor is classic Aussie Fish and Chip Shop style, almost like taking a step back in time. We ordered and I settled in to wait for our choices to be prepared, which didn't take long despite a few other customers also waiting. I was soon carrying a familiar smelling paper box back to the apartment, and once there plating up the spoils.The crisp golden batter enclosed moist flavoursome 'Local Barra' and chips were well cooked too. The 2 pieces of barramundi and medium chips came to $30, a bit on the expensive side but just about worth it given the quality of the food! The Cucina Sotto Le Stelle truck only rolls onto the Nightcliff foreshore on Wednesday, Friday and Saturday evenings. When we arrived on Friday evening around dusk there was a queue to order and dozens of people already sat around either waiting for or tucking into their pizzas. After making it to the front of the queue we put in our orders at the busy counter/kitchen and got ready for our 40 minute wait... plenty of time to build up an appetite! Eventually our number was called and we to tuck into our dinner. My Giardino with its capsicum, eggplant and onion added to the wood fired base, sauce and mozzarella was authentic and hit the spot. The Napoletana with its classic capers and anchovies kept the better half happy. Both pizzas were $15, and although not super large kept us both happy. If you arrive at a busy time, be prepared for a wait, but with great views out across the Timor Sea, there are worse places to while away time! The Darwin Trailer Boat Club is cities oldest seaside club dating from1958, when it was based in a modified caravan. It faces west is providing great views of the tropical sunsets over the water. We didn't quite manage front row seats for the sun slipping below the horizon, but were happy with our spot none the less. It actually got quite dark at our table later which wan't a problem, except for the photography! After selecting our dishes, we headed up to the counter which also featured a giant version of the menu and the specials board. I went for the Barramundi burger, with the chunk of battered local fish encased in a brioche bun along with tartare sauce and salad, topped with burger rings. The basket also contained some chunky chips and I was also able to visit the salad bar... The burger worked well and the rest of the meal left me satisfied. The meals came to $40.50 which seemed like good value. The laid back vibe and beach-side location with awesome views make it a quintessential Darwin experience. The Beechfront Hotel over looks the beach across Casurina Drive in Nightcliff. It has recently been refurbished and has a modern feel and was lively on the Friday evening we visited. We found ourselves a table out the the front and then grabbed a menu, which focused on Aussie pub dished with a bit of an NT flavour, before ordering at the counter. The lemon pepper dusted squid was tender and came with chips and salad. I had the battered NT Threadfin Salmon fillets with chips and salad. 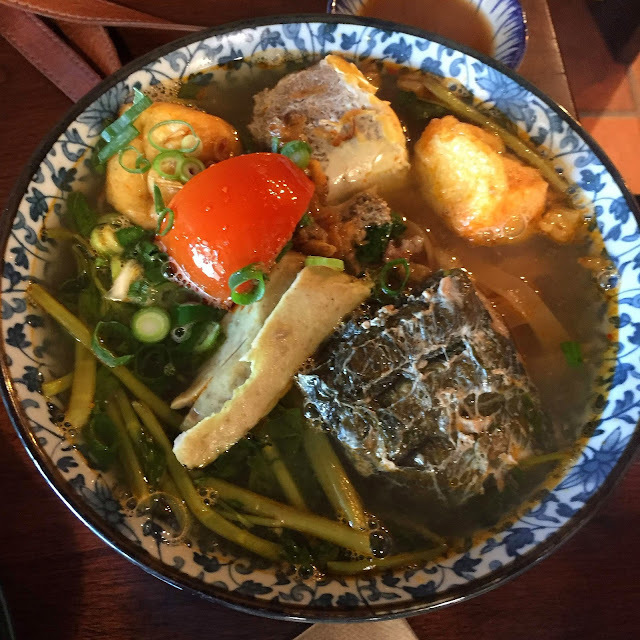 The Blue Threadfin inhabit coastal waters throughout the Indo Pacific including northern Australia waters, so it was good to try out a local catch. It was a flavoursome fish, well cooked with crisp batter. Our meals came pretty quickly despite the pub being packed on the Friday evening. The meals came to $45. The sunset views over the ocean make it a nice spot to grab a pub meal in Nightcliff. Inside the typical Smith St storefront the interior sloping 'roofs' provided a Japanese touch and a cosy feel. Out the back there was also a small courtyard area that was also busy with a group of diners. We kicked off with our favourite Japanese entrée of Edamame which we managed to get through pretty quickly, despite the the need to prize the beans from their casings. We both went with bento boxes. The Rockling karaage with chilli garlic vinegar sauce was a winner with the better half. I had the Agedashi tofu and eggplant with shiitake and ankake sauce. There were plenty of silky textures and great flavours! The service was good throughout. The bill came to around $80 including a few drinks, which seemed fair. We'd happily go back if we are in the area again. 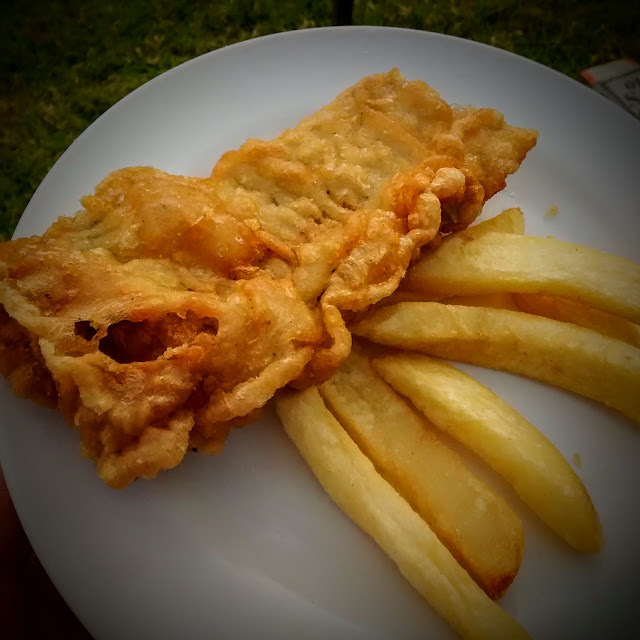 Tucked away on Griffiths street near the beach, opposite the Gardens Caravan Park and across the Moyne river from the center of Port Fairy, East Beach Fish and Chips is easily missed. The menu covers the basics with aussie style burgers and souvas on offer too. We tried it out on a family camping trip over Easter and unsurprisingly it was busy when we arrived to collect the order we'd put in by phone. We didn't have to wait too long to have our number called out, and we were soon back at our site ready to dine alfresco. I'd gone with the Blue Grenadier which was great covered in fantastic crisp batter, the choips wree good too. With an amazing sunset to watch, it turned out to be a perfect meal!